Handheld NAUTIZ X2 Rugged Android NFC RFID Mobile Computer - Nautiz X2 is a rugged handheld that runs on a powerful 1.3-GHz Quad-core processor with 2GB/16GB of RAM /Storage (10GB User accessible). BT 4.0 LE, WLAN 802.11a/b/g/n (Dual-band WLAN: 2.4G+5G), GSM / HSPA+ (3G)/LTE (4G), NFC 13.56 MHz, ISO14443A/14443B/15693. The 4.7-inch, 1280x720 IPS capacitive touchscreen is sunlight-readable and scratch-resistant. Sensors: GPS/GLONASS, accelerometer, light/proximity, Android 6 (Marshmallow) with Google Play and GMS. Each unit is supplied with battery, AC adapter incl. dock connector with power plugs EU, US, UK, AU, wrist strap and quick start guide. First, the basics: Accomplish your daily tasks with the power of a quad-core processor and easy-to-use Android 6.0 (Marshmallow) OS. But then add a high-quality, high-speed 1D/2D scanner with three dedicated scan buttons. The integrated camera offers the clarity and versatility of 8 megapixels, with autofocus and flash. And, to top it off, the Nautiz X2 has the kind of phone functionality you would expect from a consumer smartphone. 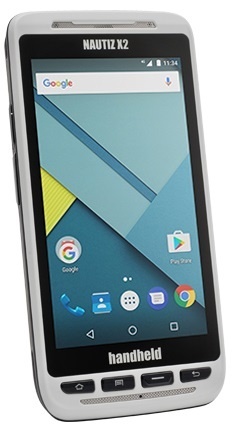 Google GMS sets the Nautiz X2 apart from other enterprise handhelds, allowing you to download Play Store apps and use Google Maps. The Nautiz X2 is a rugged superstar with efficiency at its core. The Nautiz X2 takes advantage of Handheld’s decades of experience building rugged mobile computers tough enough to thrive in harsh outdoors environments… and in your warehouse. It’s IP65-rated and meets stringent MIL-STD-810G test standards – built to survive repeated drops and punishing temperatures, and to work equally well in dusty environments or in heavy rain. Rely on it. And rugged mobility also includes an incredibly crisp, sunlight-readable 4.7” display and a capacitive screen with the toughness of Gorilla Glass and the responsiveness of multi-touch sensitivity. Introducing the NAUTIZ X2 Pistol Grip, RFID in low frequency (LF) and Ultra-High Frequency (UHF) Options. The Nautiz X2 rugged computer is a durable Android data collection PDA that can handle any environment a field worker might encounter. Loaded with enterprise-level capabilities, it delivers best-in-class field performance with a battery that works through even your longest shifts. But you will not only work faster — you’ll also work smarter. The Nautiz X2 is a fully equipped IP65-rated field computer with 4G/LTE, GPS, NFC and barcode scanning capabilities, plus Pistol Grip, additional battery, LF and UHF RFID options. And it’s available to you now at an extremely competitive price. The Nautiz X2 Rugged Android PDA now supports LF, UHF and Pistol Grip options - Perfect for logistics and warehouse data collection solutions. Handheld NAUTIZ X2 Rugged Android NFC RFID Mobile Computer , Scanner 1D/SE 965HP, 4G/EU, BT,WLAN, Camera, NFC, GPS, battery - 4.7-inch capacitive touchscreen, Bluetooth, WLAN 802.11a/b/g/n, 1.3-GHz Quad-core processor with 2GB/16GB of RAM /Storage, Android 6 (Marshmallow) with Google Play and GMS. Includes battery, AC adapter incl. dock connector with power plugs EU, US, UK, AU, wrist strap and quick start guide. Handheld NAUTIZ X2 Rugged Android NFC RFID Mobile Computer , Imager 2D/N6603, 4G/EU, BT,WLAN, Camera, NFC, GPS, battery - 4.7-inch capacitive touchscreen, Bluetooth, WLAN 802.11a/b/g/n, 1.3-GHz Quad-core processor with 2GB/16GB of RAM /Storage, Android 6 (Marshmallow) with Google Play and GMS. Includes battery, AC adapter incl. dock connector with power plugs EU, US, UK, AU, wrist strap and quick start guide. Handheld NAUTIZ X2 Rugged Android NFC RFID Mobile Computer , Scanner 1D/SE 965HP, 4G/N.America, BT,WLAN, Camera, NFC, GPS, battery - 4.7-inch capacitive touchscreen, Bluetooth, WLAN 802.11a/b/g/n, 1.3-GHz Quad-core processor with 2GB/16GB of RAM /Storage, Android 6 (Marshmallow) with Google Play and GMS. Includes battery, AC adapter incl. dock connector with power plugs EU, US, UK, AU, wrist strap and quick start guide. Handheld NAUTIZ X2 Rugged Android NFC RFID Mobile Computer , Imager 2D/N6603, 4G/N.America, BT,WLAN, Camera, NFC, GPS, battery - 4.7-inch capacitive touchscreen, Bluetooth, WLAN 802.11a/b/g/n, 1.3-GHz Quad-core processor with 2GB/16GB of RAM /Storage, Android 6 (Marshmallow) with Google Play and GMS. Includes battery, AC adapter incl. dock connector with power plugs EU, US, UK, AU, wrist strap and quick start guide.